View More In Carburetor Baffle Plate. The revolutionary perimeter injection provides optimum nitrous and fuel atomization for maximum horsepower. The ZEX dominator perimeter plate nitrous system is a complete kit that provides the optimum spray efficiency with nitrous and fuel outlets placed at 12 injection points around the perimeter of the intake manifold opening. This provides optimum distribution of nitrous oxide and fuel and delivers the most horsepower possible from your kit. Through an ingenious cooling technology called Cryo-Sync, super chilled nitrous is injected through the ZEX plater before being injected into the engine. This rapidly cools the carburetor and intake manifold, generating even greater power. 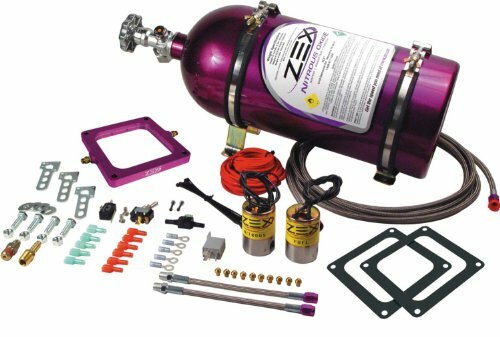 The ZEX perimeter plate nitrous system is tunable from 100-300 horsepower. If you have any questions about this product by Zex, contact us by completing and submitting the form below. If you are looking for a specif part number, please include it with your message.